Dive deeply into decadence with Chocolate Creme Brulee Body Souffle from Kama Sutra. Kama Sutra Chocolate Creme Brulee Body Souffle KS10081 - The Chocolate Creme Brulee Body Souffle encourages body exploration throught the fine art of sensual massage. Smooth these delicately scented, lusciously flavored, water-based creams over a lover's skin enticing curious kisses to follow. This rich cream also provides for a silky hand and body moisturizer. 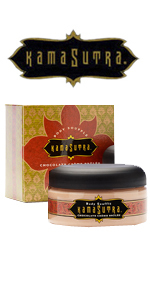 Kama Sutra Chocolate Creme Brulee Body Souffle Flavor Description: Sinfully rich, lightly whipped chocolate souffle. To Use: Massage your flavor of choice into a lovers skin. Follow the massage by lightly tracing your tongue across your lover's body, building desire and anticipation. Satisfy desire with sensations you've only dared to imagine. This gently stimulating gel, designed exclusively for women, intensifies female intimate response and encourages wonderfully renewing sensual enjoyment. Blended from a unique formulation of nature's most proven sexually enhancing herbal stimulants, these gels are designed to deliver optimum results, sending you blissfully to the brink and beyond.